NextReads newsletters deliver reading recommendations directly to patron inboxes. They are the ideal solution for busy librarians because they save staff time and help build connections to readers. NextReads newsletters are included with a subscription to LibraryAware. Each issue arrives finished and ready to go out to your patrons. 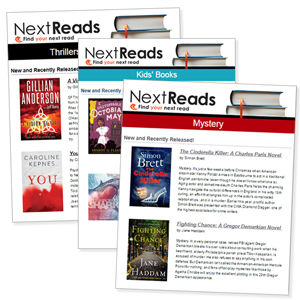 NextReads newsletters are written by the award-winning book experts at NoveList. You don’t have to do anything (unless you want to!). Our newsletters automatically link right back to your catalog, making it easy for readers to get more information or to place a hold. Your readers can choose from more than 25 NextReads newsletters, each one focused on a genre or topic. See the list of the topics covered and a sample issue. You can also create custom topics. See this example of a Graphic Novels newsletters from Durham County Library. You can put it on your website, too! Below is a sample newsletter widget. This one is just a sample, but you could link directly to your catalog, making it easy for patrons to check out or place holds.